"Anyone who seeks to lessen the honor of the Silver Star Service Banner and those who receive it, by forging, using the name Silver Star Service Banner, Silver Stars, or stealing our proprietary trademark will be pursued civilly in a court of law." The Silver Star Families of America, herein referred to as the SSFOA, was founded to remember, honor and assist wounded, ill and dying of our Armed Forces in any way possible. We do this primarily by presenting a Silver Star Service Banner and Certificate to all wounded and invalided who request one and meet our guidelines. It is our desire that every time someone sees a Silver Star Service Banner in the window or a Silver Star Service Flag flying that they remember the sacrifice so many have made for this greatn. There was no “official” or congressionally approved Silver Star Service Banner and the law prevents altering the Blue or Gold Star Service Banners in any way, including adding a Silver Star to the base banner of the Blue or Gold. In fact a major goal of the SSFOA has been to seek a uniform symbol for all of our wounded, ill, injured or dying. Since altering the Blue or Gold Star Banners was not an option, our organization adopted a new Silver Star Service Banner and Flag that did not infringe on the law or other organizations emblems. SSFOA is also seeking registration with the United States Customs Service under intellectual property. 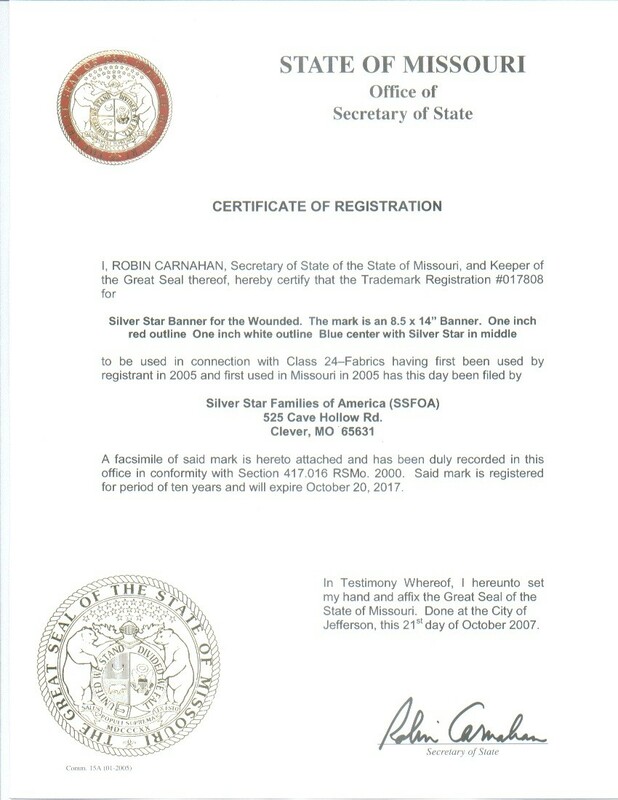 We have also filed for Service Mark status on the name, “Silver Star Service Banner/Flag and we claim the name as intellectual property of the SSFOA.” We also claim the name "Silver Stars" as it relates to an organization who assists the wounded, as a tradename. The Silver Star Families of America has invested thousands of man hours, funds, work and sweat in bringing the Silver Star Service Banner/Flag into existence and bringing it recognition Nationwide. May 1st has been designated "Silver Star Service Banner Day" across the 50 states and passed unanimously in the House and the Senate. Now, states, cities, counties, organizations, the workplace as well as individuals are declaring the SSFOA Silver Star Service Banner/Flag their official symbol for all our wounded, ill and dying. The SSFOA Service Banner and Flag has become THE recognized symbol for our wounded, ill and dying not only nationwide, but in Iraq, Afghanistan and Germany. The strength of our trademark is overwhelming. The SSFOA has designated one manufacturer of our Banners and Flags to insure quality control. Since we issue our Banners for free to those who qualify and since we have worked to make this symbol recognizable nationwide as the symbol for our wounded, ill and dying, we will protect our trademark vigorously. * Anyone who seeks to lessen the honor of the Silver Star Service Banner and those who receive it, by forging, using the name Silver Star Service Banner, Silver Stars or stealing our proprietary trademark will be pursued civilly in a court of law. servicemarked if used in regard to another profit or non profit that works with the wounded, ill and injured of our Armed Forces. The declaration of use or excusable nonuse filed for the above-identified registration meets the requirements of Section 8 of the Trademark Act, 15 U.S.C. §1058. The Section 8 declaration is accepted. The declaration of incontestability filed for the above-identified registration meets the requirements of Section 15 of the Trademark Act, 15 U.S.C. §1065. The Section 15 declaration is acknowledged.